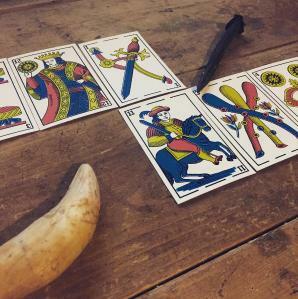 Come learn the baraja española! A system of card reading deeply embedded within Latin American culture, cards that evoke gitanas and other spirit guides, old black clad curanderas, shape shifting witches and the witch hunters who pursue them, and reveal forbidden knowledge! These are the 'fruits of the tree of knowledge', the 40 hours of Jesus in Hell and the 40 days and nights of Rain that permit the World to be born again, the 50 'Righteous People' that save us all, the feast of Fifty Days where the Holy Spirit descends in tongues of Fire, where cards become saints and speak litanies of prayer for good and ill when we know how to wield them! Come learn these cards within their own cultural context on their own terms- let the cards speak and speak true to you and your situation, for guidance and even for use in rituals to change your fate for the better! The baraja española, or Spanish cards, are a form of playing card common in Iberia, Morocco, Sardinia, Sicily, Southern Italy, Hispanic America, and the Philippines. While related heavily to the French playing cards most Americans are familiar with, they are an earlier permutation that derived directly from Mamluk Arabs. With unique suits, different numbering systems, different amounts of cards- the Spanish cards have a unique tradition of cartomancy associated with them. As early as the early 15th century, evidence for a system of Spanish cartomancia can be found. Eventually these printed aphorisms, ascriptions and culturally relevant ‘meanings’ eventually developed into full manuals of cartomancia, circulating widely by the 19th century through out the Spanish speaking world. Reading the 48 (or 50) cards of the baraja española, while similar to other methods of cartomancy, maintains its own body of lore and esoteric ascriptions. This course will go over the popular 19th century ascriptions that have become standard in Latin American divination with the deck, as well as a few different permutations that read the brisca/ombre popularized deck of 40 cards. Detailed information on the qualities and common traditional meanings of each card of the four palos (suits)- bastos (clubs), oros (coins), copas (cups) and espadas (swords)- will be covered, as well as the broader understood esoteric ascriptions of these cards that place them in a slightly different understanding and cosmology than common 20th century tarot influenced interpretations of such pip cards. Uses of the pinta and different understandings of the court cards–the sota (the knave), the caballo (the Knight), and the rey (the King)- as well as the comodines (jokers) will all be explored in depth. While some of these culturally embedded concepts are about memorizing [new] information, we must also understand the specific flavor of these ascriptions to the Spanish schools of cartomancy. Reading the cards in context to other cards and drawing upon cultural and personal mythology for individualized interpretation rather than solely upon memorized keywords and location in a spread will be a focus of our study. This course will set people up to start to dive into reading with the baraja española, with subsequent classes in the future that build upon this foundation to explore alternate and advanced techniques. The course will be taught by Jesse Hathaway Diaz, the Goat of Wolf & Goat, who has been reading with and researching about the Spanish cards for two decades, and continues to study techniques and ritual uses of these cards throughout Latin America and Iberia, especially in the traditions of Mexican curanderismo and Cuban espiritismo. 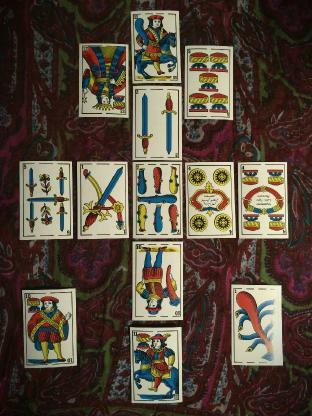 A Moroccan deck of the naipes españoles, a favorite of the Goat. Classes will be starting in May, and this will be an on-going 15 week course. Classes will be recorded and distributed among actively enroleld students. See Syllabus below for more detail. Classes will begin May, exact day announced April 1. The same information will be covered in each 'section', and the price is for a complete unit (either Saturdays or Mondays).